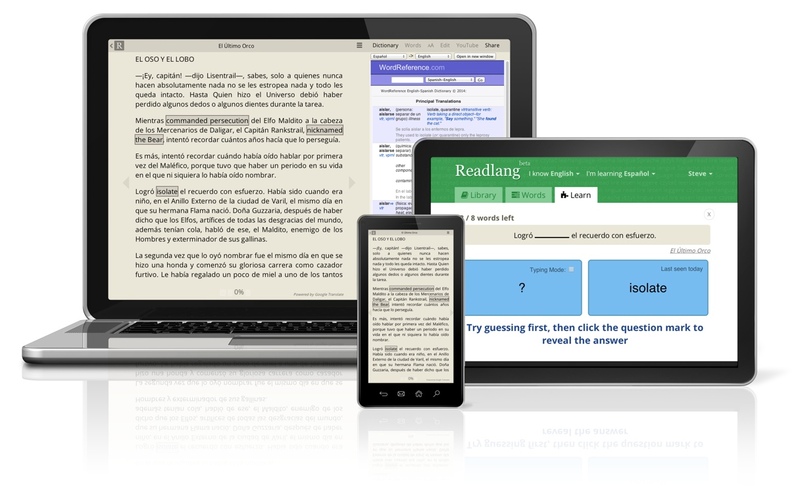 In today’s guest post Steve Ridout tells us how he started Readlang, a site suited for more advanced language learners. I’m Steve and I create and maintain Readlang, a language learning web-application which allows you to consume media in your target language. Designed mainly for reading novels and other long form texts, but it’s also used to read websites, watch YouTube videos, and listen to songs. The great thing about it it’s simple inline translations which allow you to quickly understand unknown words and phrases, and that it tracks your progress to provide you with tailor made flashcards based on the books and texts you love to read. The idea came after I’d been living in Madrid for 6 months, and wasn’t happy with my progress in learning Spanish. This was largely because I wasn’t using it on a daily basis. I would almost always talk in English at home, and I was working remotely with English speaking people. The times I would try to socialise in Spanish were difficult and stressful because I just couldn’t understand most conversations. I was falling into the typical ex-pat trap and needed to make a change. I decided to immerse myself in the Spanish language, and chose reading as my primary habit to do this. Reading is great because it exposes you to lots of new vocabulary and isn’t stressful like talking can be, at least for an introvert like myself. And from this the site was born. I’ve been very pleased with the response. Nearly 10,000 people have signed up so far and a lot of have told me that Readlang is exactly the app they’ve wanted for years, which is incredibly encouraging and rewarding. And some are willing to pay a small subscription to use the site very heavily. On the other hand, it’s still not providing me enough to live on, so I’m currently contracting as a software developer for a few months to stock up my savings and will return to working on Readlang full time soon. I still use it regularly, it’s especially useful now that I’m back in the UK to have a little exposure to Spanish every day. If you’re learning a language, and are ready to start tackling simple native texts, give it try. I think you’ll like it. This entry was posted in Guest Post on September 13, 2014 by Oliver Antosch. renshuu.org started out as a tiny personal project to fight the most deadly of foes: laziness. At the time, I was a university student studying Japanese, and it was an almost daily battle to create and keep track of hundreds of paper flashcards that were going to keep me alive while I was learning Japanese. While I did and still do enjoy studying, I have never had any love for the ‘secretarial’ side of studying: making flashcards, keeping them organized, and trying to rewrite the bad data in my head when I would realize weeks later that I had miswritten part of a kanji character on one of my cards. I was majoring in computer science at the time, so it was a natural fit for me to make a site that would help automate all the busywork of language studying so I could focus on the actual learning. The only thing I would change if I could jump back to this point in time is that I would have build it from scratch as a tool for anyone to use, instead of creating it as a personal site and slowly growing it out from that point. It has been about 13 years since renshuu.org was made and has been helping me (and many others) enjoy learning Japanese without spending unnecessary time fiddling around with my study materials. It has always been a second job next to my (hopefully) lifelong profession of teaching: I am currently designing and teaching a new curriculum for the language wing of a private high school in Japan. Fortunately, I have had two more people join me (we all work on renshuu as a second/side job) in building the completely rewritten renshuu 3.0, which is in beta at the time of writing this. Although renshuu has grown in size and scope so that I could not possibly detail all the cool features built in, I am happiest with the level at which the site is able to customize itself to match any user’s Japanese knowledge level. No two students are alike – even a class using the same textbook will create learners of different knowledge levels as people supplement their Japanese with new words and expressions from books, anime, games, etc. renshuu’s system keeps track of everything you learn on the site (with both broad and fine-toothed options for specifying kanji/vocab that you already knew before joining the site) and will, per your preferences, display all vocabulary, grammar explanations, and example sentences to match your personal knowledge level. – generate personalized quiz questions that help reinforce the material by never showing you incorrect answers that are easy to spot because they are words you’ve never studied before. While many study sites do a good job of keeping track of which ‘flashcards’ you know and don’t know, renshuu’s system leaps past that and makes ALL the content in the site aware of your knowledge level so it can react and provide you with a personalized study environment. We’re a very tiny group and we like to keep in touch with our users, so if you join us and have any questions at all, you can post anywhere in the site asking for Michael and I’ll be there to help! This entry was posted in Guest Post on September 9, 2014 by Oliver Antosch.